The Solana solar power plant uses 3,200 mirrors that are tilted so they focus the sun's rays to heat a specially-designed oil. The heated oil boils water, which drives turbines and generates electricity. The heated oil can also heat giant tanks of salt to store energy. When the sun goes down, or when households need more power, the hot salt tanks heat up the oil, which again boils water to drive the turbines. Whereas conventional solar panels only give power when the sun is up, the giant salt batteries give renewable energy on demand. They can store six hours-worth of energy, which can meet the demands of Arizona customers, according to months of test data. The plant is located outside Phoenix, Arizona, and was commissioned in October 2013. 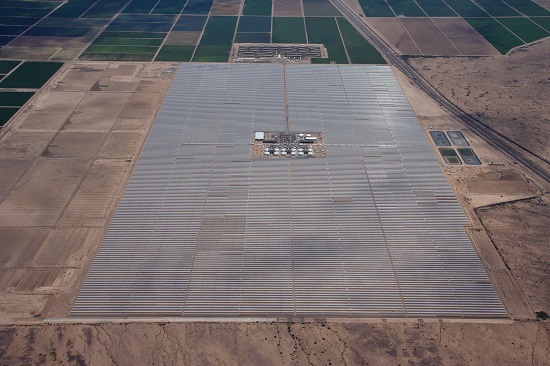 This is one of the largest solar power plants of its kind in the world. But unlike other solar farms, this plant continues giving power to 70,000 Arizona households long after the sunset. Arizona Public Service (a utility company) has bought power from the plant for the next 30 years to meet Arizona's goal of generating 15 percent of its energy from renewable sources by 2025. Energy bills for APS customers will increase by an extra $1.28 per month for the first five years, $1.09 per month for the next five, and then 94 cents per month after that. The total cost was US $2 billion price. Abengoa Solar is using technology to build a similar, though smaller plant in the Mojave desert in California, which will come online next year, as well as plants in South Africa. This page was last modified 00:16, 13 October 2013.